Recent revelations show that Health Canada and Canadian Blood Services (CBS) collaborated to support the establishment of Canadian Plasma Resources (CPR), for-profit clinics, across Canada. These private plasma clinics directly undermine our public system of voluntary blood and plasma donations. Health Canada has also established an expert panel that’s investigating the safety and sustainability of the country’s plasma supply. But the credibility of the panel and the advice it will give is already being called into question. These discoveries have come right when we are preparing to mark the 20th anniversary on November 26 of the Krever Report, which concluded that Canadians should not be paid to donate blood and plasma. Documents obtained through Access to Information show that Health Canada and CBS worked with CPR to help it establish pay-for-plasma clinics. This has caused the number of voluntary blood and plasma donors to decline. Health Canada is supposed to be regulating Canada’s blood supply system. It shouldn’t be working with private companies and the country’s blood services operator in a manner that undermines that system. Kat Lanteigne, Executive Director of BloodWatch said it is a huge breach of public health protocol and a massive breach of public trust. It’s also worrisome that, of the four advisors serving the Health Canada panel on plasma supply, two are American. To make things worse, one of the panelists owns stock in private, for-profit plasma companies, the very companies that provide fractionation services to CBS. This is a major problem because it fundamentally compromises the credibility of the panel. Plasma collection services need to be expanded across the country. But this must only be done through the CBS and public collection sites. 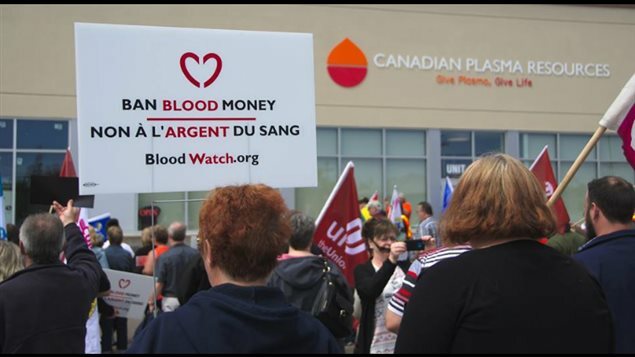 Plasma for Profit: Why is Health Canada allowing paid plasma collection?